We're gonna need a couple strategically placed zippers. | Warner Bros. Here's the thing about superhero suits: They may look cool, but they're not exactly practical. Ever tried fighting crime in a onesie? Not as easy as the Avengers make it look. 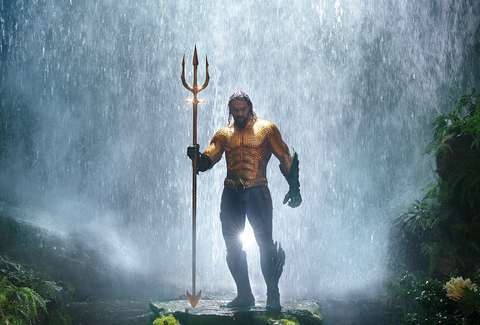 While filming the upcoming Aquaman movie, Jason Momoa encountered one very tricky aspect of his costume that may make you rethink superhero attire forever. While chatting with Entertainment Weekly about the meticulous design that went into everything from the settings in the movie to what everyone on set got to wear, Momoa and co-star Amber Heard, who plays Mera, mentioned one unfortunate fact about their very cool getups: it's pretty much impossible to go to the bathroom while you're wearing them. It's hard enough for us regular folks during a visit to the facilities to shimmy ourselves out of the fancy jumpsuits we thought would be a good idea for a party longer than four hours, so just try to imagine doing that with a costume that's been more or less vacuum-sealed to your entire body. "It looks like it's easy to pee in that," Momoa said after Heard waxed poetic about the intricacies that went into designing their suits. "But really it's not. And if you have the poopsies, it is very challenging. You've gotta be really good at holding it." Momoa wears a newer, flashier, more classic costume in Aquaman that calls back to the character's original two-tone getup in the comics. This version also comes with shiny boots and glittery golden fish scales all over the top half to make it even more eye-catching -- and probably to distract from the less practical aspects of it. Maybe the sequel's version will come with some buttons in the back, like a baby onesie. Or maybe a zipper. Give us a call if you need any ideas, Warner Bros. Our superhero diapies are full of them.